If you are waking up to one of the coldest mornings in the last several years. Here at our house in Indy it is -12 with a -24-26 wind chill you probably did the usual, went downstairs , checked your thermostat to see how well your furnace kept up and of course turned on your water and hoped it came out. If you survived intact, you realized your furnace never stopped running last night and in the back of your mind you have that nagging thought of just how bad that winter heating bill will be. So how did those Victorian keep warm? Well we all have the romantic view of Victorian life, opulent rooms with servants bringing by an extra blanket as the fire roared in a grand fireplace as you sipped your hot tea. Well that wasn't the 'real world' of most people in the Victorian era. Opulent Velvet Drapes were the province of only the very wealthy and could cost hundreds of dollars. Most Victorian had to 'get by' by sewing their own drapes. Middle and upper class homes did however have what we called summer drapes and winter drapes. One of the 'chores' of spring cleaning was the removal of heavy drapes and replacing them with a light lace curtains. Most 'less than affluent' Victorians pretty much do what most of us modern day Old house people do. They nailed or tacked blankets or fabric over the windows in really cold periods. They also closed off rooms that were not used either by closing pocket doors and or the use of Portiere which has a drape that closed off a doorway. While many Victorian homes in cities might have gas which powered those lovely cast iron fireplaces you saw in every room of a Victorian townhouse. Many houses would have had wood burning stoves. Usually in the Parlor or living room and off course the wood stove in the kitchen. In cold weather it was critical to keep these stoked and while the husband went off to work every day it was the "lady" of the house who usually hauled wood in and threw it in the stoves. Children were a blessing because that chore would then fall to the children. Victorian knew how to "layer' clothes. What we may now view as the 'stuffy' garb of the Victorian era actually had a practical side in winter....it kept you warm! Men wore 'long johns' under their cloths and women had layers of petticoats. Staying warm at night was the biggest problem. Even in many middle class homes the only source of heat was on the first floor. Assuming you got the downstairs hot enough the rising heat might make the night 'passable". You often found a cast iron grate between floors to allow heat to rise into the upstairs bedrooms. 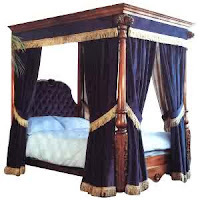 Of course we all think of the grand Victorian bed possibly a 4 poster covered with elegant linens. The best mattresses were filled with horsehair, next step down was cow’s hair, then wool. A straw mattress was often put down under a hair one to protect it from the iron bedstead. Chain-spring mattresses were available in the second half of the century, but they were expensive, and they still needed a hair mattress over them. A square of sheeting was often tied over the springs to prevent them from chewing up the mattress, which was then covered in sheeting to protect it from soot and dirt. If the bed had no springs, a feather bed could be added on top of the mattress. These were expensive and hard to maintain. An under blanket was usually put over the hair mattress. All this needed to be turned and shaken every day, because the fibers tended to mat and clump. Your linens would consist of an under sheet tucked into the lowest mattress to protect it from soot, a bottom sheet, a top sheet, blanket (in winter 3-4 of them), a bolster, and pillows. They would be covered in Holland sheeting then with pillowcases. One good housekeeping writer recommended that blankets be washed every other summer, and sheets once a month, unless 2 people shared the bed, then wash every 2 weeks. Not all sheets were washed at once. The bottom sheet would be taken off and replaced with the top sheet and a clean top sheet put on. The main bedding cleaning was twice a year, spring and fall. The mattresses and pillows would be taken out and aired and every few years taken completely apart, washed, and feathers sifted to get rid of dust. This kind of work could only be accomplished if you had enough room and help. Many could not manage it.A good housewife was expected to check the bedding for fleas and vermin every week. If you found them it meant a major war had to be waged. The bed would have to be taken apart and the pieces washed or soaked with chloride of lime and water. The room had to thoroughly cleaned and disinfected. All cracks had to be repaired and sealed. If the infestation was out of control the bed would be put in an empty room which was sealed airtight and then sulfur was burned to disinfect the bed and surrounding area.People mistrusted laundries because they weren’t sure of what might be in their things when they were returned. They felt the same way about buying used furniture. Quilting was not only a social pastime but an essential 'chore' as bed linens from a store were often expensive and beyond the means of most people. 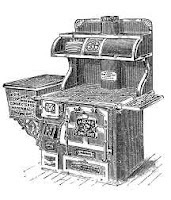 Victorians Piled on the blankets to keep warm which is why blanket chests were so popular. You needed one to hold them and you needed allot of them to stay warm! So while we will all grumble next month when that high heat bill arrives, remember, at least we have furnaces! Paul, we have so enjoyed this! We were just talking about this the other day....how DID they do it? 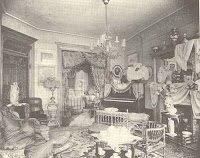 At a balmy 65 in our Victorian home....and no insulation in the walls it has been chilly, to say the least, and I can't help thinking of the family that built the home and how cold it had to have been for them!